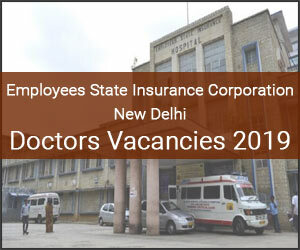 New Delhi: The Employees’ State Insurance Corporation, Okhla Phase-1, New Delhi (ESIC New Delhi) releases 32 Vacancies for Specialist, Senior Residents on Part-Time, Full-Time and Contractual Basis. The Selection Will be Based either Written Exam/Interview. Walk-in-interview for the post of Senior Residents in the following departments of ESI Hospital, Okhla, New Delhi for a period of one year and extendable for another period of one year subject to maximum of three years. The Vacancies are in the Department of Anaesthesia, Dermatology, Gynaecology, Orthopaedic, General Medicine, Paediatrics, Radiology, Surgery. Qualification: Post Graduate Degree or Diploma in concerned specialty from recognized university, registered with Delhi Medical Council or Medical Council of India or State Medical Council. Age: Not exceeding 37 years as on 05/04/2019 (Relaxation for SC/ST/OBC as per rule). OBC Certificate should be in the prescribed form as per Govt. of India instructions which should certify that the candidate does not belong to any one of the creamy layers. Emoluments: Pay & Allowances as per rules applicable. Age:Not exceeding 37 years as on 05.04.2019 (Relaxation for SC/ST/OBC/PH/Ex­Serviceman as per rules). The Vacancies are in the Department of Anaesthesia, Gynaecology, General Medicine, Orthopaedic, Paediatric, Psychiatry, Surgery. Qualification: MBBS with Post Graduate degree/diploma in concerned speciality from a recognized University with 3 years experience after acquiring the Post Graduate Degree Or 5 years experience after acquiring the Post Graduate Diploma. Full Time Contractual Specialist: Not exceeding 45 years as on 05/04/2019, relaxation for SC/ST/OBC is as per rule in case. Part Time Contractual Specialist: Not exceeding 66 years as on 05/04/2019. The Vacancies are in the Department of Anaesthesia, Orthopaedic, Paediatrics, Radiology, Surgery. Interested candidates may appear for interview with attested photocopies of Matriculation certificate, proof of age, Caste Certificate, MBBS, Diploma/Degree certificate, attempt certificate of MBBS valid DMC/MCl/State Registration Certificate & Experience Certificate, along with originals. Candidates should also bring two recent passport size photographs along with proof of residence. Fee: For General & OBC Candidates fee is Rs. 300/— and for SC/ST is 75/— in the form of Demand Draft payable in favour of ESI Fund A/c no. 01. There is no fee for women & PWD Candidates. 1. Private practice of any kind will not be allowed except for part time specialist. 2. No TA/DA will be paid to candidates for appearing in the walk-in-interview. 3. Application should be submitted for each post separately. 4. Reservation for PWD candidates is as per rule. 5. The Medical Superintendent reserves the right to alter the date or cancel the interview without assigning any reason thereof. 6. Hostel accommodation/quarters will not be provided. 7. Vacancies are likely to change depending upon actual requirement at the time of interview as per discretion of Medical Superintendent. 8. If no candidate appears against the above advertised post as mentioned, then the available candidate of any other category may be selected for 39 days as per requirement & the ESIC regulations. 9. At the time of joining selected contractual candidates will have to sign an “AGREEMENT” as per ESIC norms on non-judiciary stamp paper of Rs. 100/-. THREE YEARS OF PRIME TIME OF LIFE IS / WILLL BE LOST WITH UNCERTAINTY. IT\’S MORE LIKE A DEAD END ? WITH OUT HOSTEL ACCOMMODATION & MESS , I THINK MOST OF TIME AND MONEY WILL WASTED ONLY IN TRAVELING AND FOR THE FOOD. THE TERMS AND CONDITIONS LOOKS VERY INTIMIDATING. INSTEAD OF BEING THANKFUL FOR JOINING THE ESIC ., IT\’S SHOWS ARROGANCE ATTITUDE ON THE PART OF THE HIGH-HANDED , AKWARD GOVERNMENT SERVENTS , THEY ALWAYS THINK AS MASTERS. MY PERSONAL SUGGESTIONS TO THOSE, WHO ARE GOOD AT , LOOK FOR BETTER OPERTUNITIES. THOSE WHO HAVE NO CHOICE CAN THINK ABOUT TAKING UP SUCH JOBS .